Roasted., a new coffee shop at 13th and K streets, will fit right in with its political satire theme. 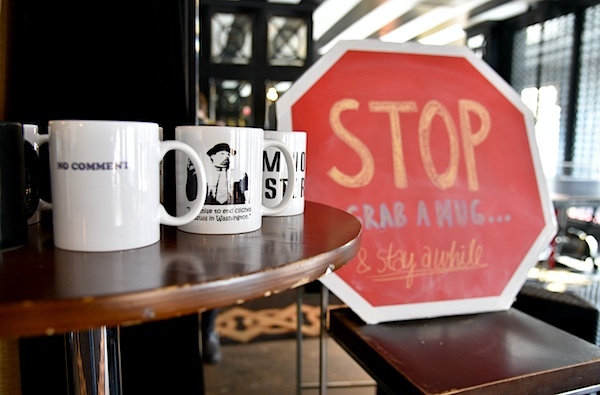 Take a break from your daily grind at “roasted.” – the District’s newest club-turned-coffeeshop that’s using political satire as its best shot (espresso, not vodka) at breaking into the D.C. caffeine biz. That’s a latte handle, but Pierre Jimenez, co-owner of roasted. and a coffee guru, thinks he’s up to the chai-llenge. Roasted., located on 1301 K St. NW, officially opened its doors on Jan. 4 and serves politically punny coffee to early birds. It was actually Jimenez’s fraternity brother and Capitale nightclub owner David Chung who approached Jimenez with the idea of opening a coffee shop in his nightclub during daylight hours. “He was like, ‘I got this great club in D.C., there’s nothing going on during the daytime. It’s a waste of space. Think you can put a coffee shop up in that spot?’” Jimenez said. When Jimenez saw the Alice in Wonderland-esque decor, complete with a black-and-white tiled floor, emerald-green-and-purple walls, overstuffed armchairs and bookish knickknacks, he knew that he had his shop. To top it off, the space was huge. Unlike the claustrophobic coffee shops that littered the District, roasted. had enough room to host hordes of under-caffeinated millennials – and, in the future, live entertainment. Ultimately, Jimenez hopes roasted. will become a gathering forum for a variety of political enthusiasts to come and debate. “Eventually I want our brand to be synonymous with political satire,” Jimenez said. Although roasted. is young, Jimenez is an old hand at the coffee biz. He currently owns and operates two coffee shops in Virginia dubbed the Coffee Club Cafe, as well as a catering espresso bar on the side. Jimenez’s experience in catering espresso has proved invaluable to setting up roasted., as the shop has to disappear without a trace every weekend to make way for the club Capitale. “Everything in here has got to be able to be moved. That really impacts the type of equipment you can use, the accessories you can have. So [roasted.] had to be something mobile, almost,” Jimenez said. The transitory nature of Roasted fits right in with the progressive vision that Jimenez has for it. “The idea is to always have something new and fresh,” he said. To help him with that, American University graduate student Tara Schoenborn brews up some pun-tastic ideas for coffee names or witty political quips for the chalkboards outside. She first started working for roasted. back in July to “pay off the rent” and has since become an indispensable part of the team. Drinks at roasted. are heavy on the political references, like Trump’s Tiramisue Latte, and use locally sourced coffee. Some of her most inspired and controversial creations, which you can find descriptions of on their website, include the Trump’s Tiramisu Latte (“This chocolate & amaretto mix makes America great again. Italy is irrelevant”), Independent’s ‘Insert Here’ Latte (“Can’t pick a side? Design your own … and maybe next time consider living in reality”) and Frank Underwood’s Frappes (“As cold and tasty as this House of Cards character’s heart”). Schoenborn and Jimenez both want their clientele to become an integral part of the cafe, envisioning a coffee shop that is as interactive as it is maverick. In the near future, Schoenborn said she’d like to see a “wall of fame” where artists can leave their own renditions of our lovable neighborhood sycophants. Or, if you’re a punny sort of person, pitch in your drink name ideas and you just might see it on the menu. “It’s a community collaboration,” Schoenborn said. As for the prices, an average cup of joe will set you back about $3 to $4, but rest assured that you’re paying for quality. Roasted. buys their beans exclusively from top-notch local roasters such as Compass Coffee and Shaw. Baked goods are not being sold at the moment, but talks are currently underway with local bakeries to remedy the glaring loss of croissants and morning buns. Roasted., located on 1301 K St., is open Monday through Friday from 7:30 a.m. to 4 p.m.